Ridesharing has changed how we think about getting around, and that goes for work travel, too. But is your travel policy in the best shape when it comes to when, how, and where your employees can ride? App-based ridesharing is simply part of the traveler experience in most cities now, just like other options already in your travel policy such as hailing a taxi or calling a car service. Your travelers may not see a difference between the 3, but ridesharing apps can offer more options—in terms of flexibility, class of service, expensing, and more. As a manager of travel, this presents an opportunity to optimize your policy to ensure a smooth and compliant experience. Whether you’re creating a travel policy from scratch or you’re revising a longstanding document, the ridesharing reality needs to be part of your traveler guidelines. 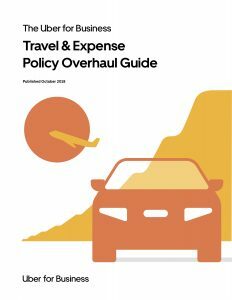 In this blog post, we review key considerations for this new addition to your travel and expense (T&E) policy. We also offer tips for taking advantage of business-friendly features that can help with expenses and improve the overall experience for traveler and travel manager. Your policy’s purpose should be at the heart of any decision made. What is the main objective of your policy? Is your company trying to control costs, improve compliance, increase traveler satisfaction, or strike the right balance of all 3? Answering that question can help steer your decision-making process. Ride type: The available vehicle types closely mirror flight classes and can be treated similarly in your ride policy. Generally speaking, this means employees can take UberPool, UberX, or UberXL trips like economy class, while Black might be reserved for C-level executives or people traveling with business guests. Eligible trips: Does ridesharing make the most sense for short distances, such as from the hotel to a conference, or to and from the airport? Or can it be used in lieu of a rental car on longer, multi-day trips? Scheduling: Apps like Uber allow you to schedule trips in advance—particularly handy for an early-morning flight. Consider including language that encourages travelers to schedule important or time-sensitive trips in advance, to protect against longer wait times. Sharing: If a group of employees is traveling together, you may consider prompting them to share a ride with more seats, with the most senior person in the group responsible for expensing the trip. Harnessing the full power of ridesharing apps doesn’t stop at simplifying the physical trip process for employees. It can also mean far easier expensing and tracking—music to the ears of travelers and managers alike. Business profiles: Determine whether travelers are required to create a business profile to keep work and personal rides separate. With a business profile, travelers can keep tabs on the purpose of each trip, without needing to create a new account just for work. Admins can also set requirements for expense codes and other controls. Expense integrations: Uber for Business offers direct integration with a number of expense reporting platforms. Not only does this eliminate the need to tally paper receipts, but it also ensures accuracy on your expense reports from the get-go. Central billing: Travelers can skip the reimbursement process altogether and charge their trips to one organization-wide payment method, reducing the need for employee reimbursement while still providing trip-level visibility for the travel management team. While ridesharing comes increasingly naturally to travelers, it still needs to be formally addressed in your travel policy. Ride classes, trip eligibility, and cost all need proper guidelines to help your traveler make the best decisions on the road. A lack of formal policy could also mean that you’re inadvertently excluding extra features that could smooth your expensing and reimbursement process. Whether you’re exploring your first travel policy or revising your current one, Uber for Business’s free guide can direct that process, including assistance on ridesharing.